Bellbrook junior Braden Norckauer ducks away from an inside pitch as Wayne catcher Dylan Borns makes the grab, April 10 in a high school baseball game in Bellbrook. 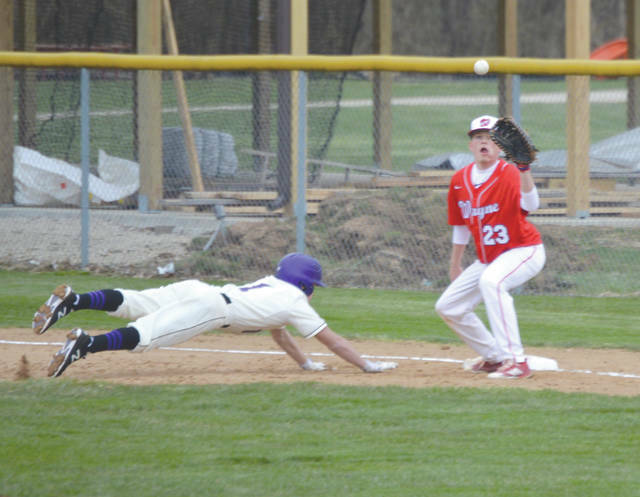 Bellbrook’s Sam Sherrill dives back to first base as Wayne’s Jacob Reedy looks in the throw, April 10 at Bellbrook High. Wayne won the non-league game 6-1. 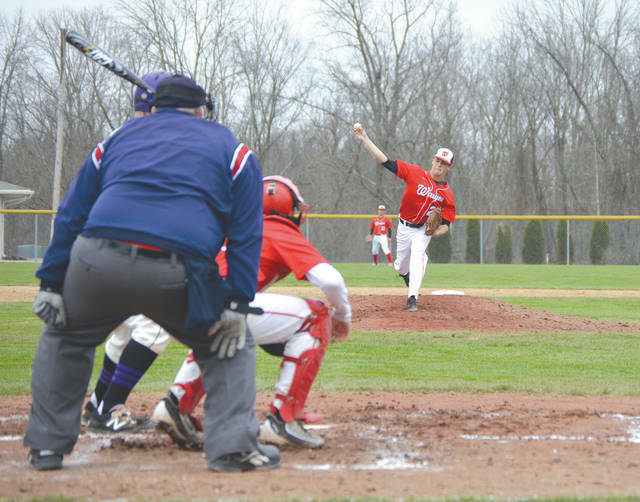 Warriors starting pitcher James Ganion delivers a pitch during Tuesday’s road game at Bellbrook. Wayne won the contest, 6-1. 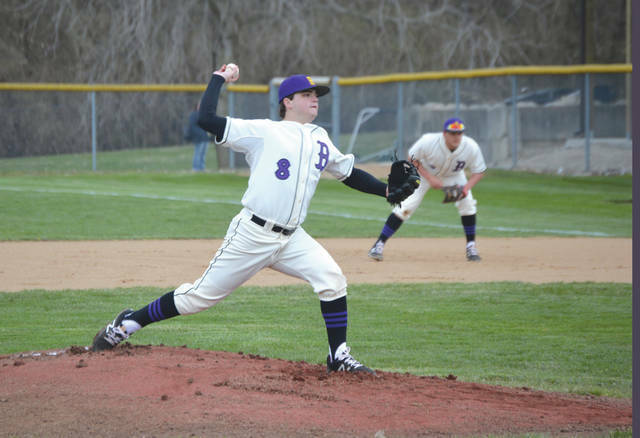 After being touched up for four runs and five hits in the first, Bellbrook starter Andrew Peters limited Wayne to one hit over the next four innings in an April 10 non-league high school baseball game at Bellbrook High. Wayne senior outfielder Jacob Duncan smacks a single to right field in the four-run first inning of Tuesday’s April 10 game at Bellbrook. The Warriors won the game, 6-1. 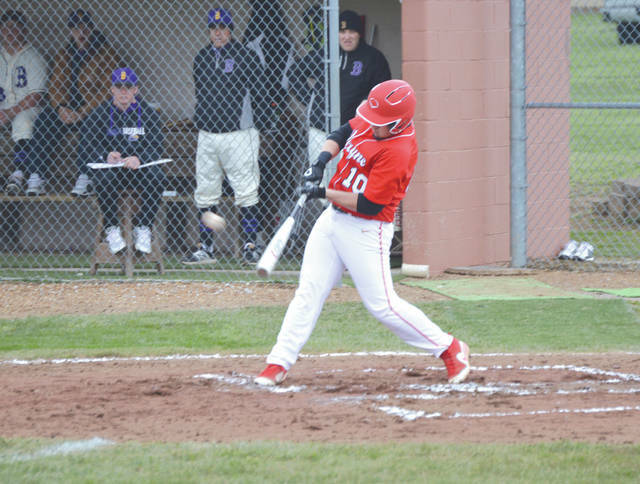 BELLBROOK — The visiting Wayne Warriors jumped on Bellbrook pitching early, then extended the lead for a 6-1 non-league high school baseball win, April 10. Kevin Baugh, Jacob Duncan and James Ganion — Wayne’s 2-3-and 4 batters in Tuesday’s lineup — hit back-to-back-to-back singles, with Baugh scoring the game’s first run on a balk. Duncan then scampered homeward on a Golden Eagles wild pitch and then Ganion scored on Dylan Borns’ groundout to shortstop. Chase Kroplin then singled, advanced on two walks and scored on Cole Kehl’s single into left for a quick 4-0 Warriors lead. Bellbrook starter Andrew Peters then settled down and limited Wayne to one hit over his next four innings of work. Peters singled in the third inning, advanced on Adam Galle’s single to right, then scored on an infield throwing error, for what turned out to be the Eagles’ only run. Speedy pinch runner Jordan Long scored on Kehl’s sixth inning sacrifice bunt, then Ganion scored on a seventh inning wild pitch for Wayne’s final two runs of the contest. Wayne coach Joe Young could be heard encouraging his players to keep pushing themselves to score more runs throughout the game. The temperature was a chilly 42 degrees at game time. For a pair of area teams just getting back from Spring Break trips to Florida, it might as well have been 20 degrees. “We’re trying to watch our pitchers in this weather, and James Ganion did a really good job for us today,” Young said. Unofficially, Ganion limited Bellbrook to four hits in his four innings on the mound. Then, sophomore reliever Caleb Mervar came in and held the Golden Eagles to one hit the rest of the way. Young credited Bellbrook starter Andrew Peters with a quality outing on the mound as well. The senior righthander regained his composure after the four-run first inning, and kept the Warriors off balance. Bellbrook coach Rich Demko was just as impressed. Galle had a double and a single, reached after getting hit with a pitch, and nearly had a third hit for the game, but Wayne’s Jordan Long raced in from left to make a diving catch. 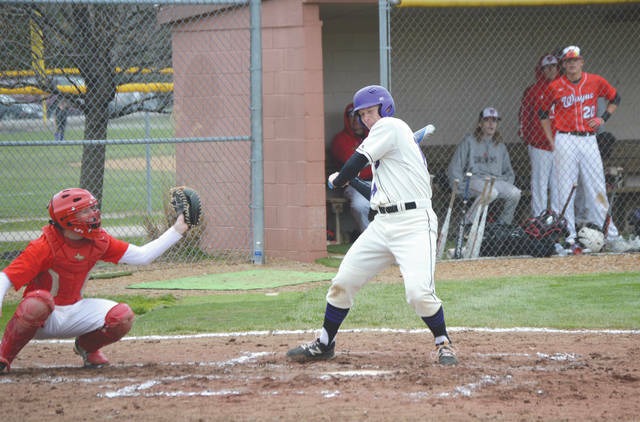 Peters and Braden Norckauer had the other hits for Bellbrook. With a plethora of rain and snow postponements, Bellbrook has five more games scheduled this week. They play at Kenton Ridge on Wednesday, April 11, they’ll host Southwestern Buckeye League foes Eaton and Valley View on back-to-back 5 p.m. contests Thursday, April 12 and Friday, April 13, then they have a doubleheader at Beavercreek, with games at 11 a.m. and 1 p.m., on Saturday, April 14. Wayne is in the same boat. The Warriors head south to Prasco Park in Cincinnati to play Lebanon on Wednesday, April 11, they return home to host Sidney at 5 p.m. Thursday, April 12, then they have road games Friday April 13 (at Springboro) and Saturday April 14 (at Springfield Shawnee).